America’s veterans are a dedicated group who often postpone their needs and job pursuits while putting the safety of our country first. There usually comes a time, however, that they move beyond their military careers to join the civilian workforce. Whether they finish their active duty service first or choose to enroll while still serving, pursuing a secondary education has some unique challenges for the military community. Learn how one of today’s best and brightest transitioned from military service to academia, and why pursuing a degree while in the military has its perks. 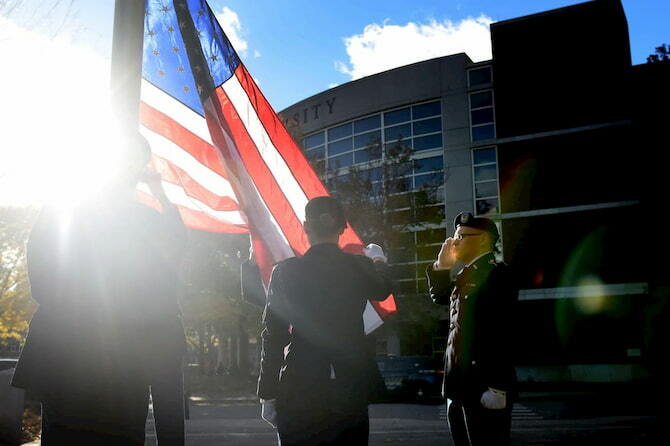 Thomas “Tommy” Furlong is a career and academic coach with the Dolce Center for the Advancement of Veterans and Servicemembers at Northeastern University. He’s also someone who understands the challenges of active, reserved, and retired servicemembers who are ready for that next step in life. Tommy spends his days consulting with members in all branches of the military who are pursuing degrees in a variety of programs. But before he was a career coach, Furlong was a military servicemember himself, meaning he’s uniquely qualified to answer questions active servicemembers and veterans may have. Tommy regularly shares advice with those hoping to jump-start their career with a degree but is especially passionate about helping servicemembers transition to a civilian career through a Northeastern University education. Furlong says he felt the call to serve all the way back to his time in high school. He was deeply affected by the events of 9/11 and, with an older brother in the navy and a father who had served in Vietnam, it felt natural to join the family’s legacy of service. “After everything that happened, I wanted to be a part of it,” he shares. Despite his call to serve, Furlong put off enlisting until after earning his degree. While it’s common for military members to start serving right out of high school and pursue a degree after exiting the military, Furlong took a different path. He graduated from Berklee College of Music in 2007 before being commissioned as an officer in the Marines, where he served four years as an infantry officer. During that time, he was deployed to Afghanistan in 2010 and left service when he returned in 2011. Then, he started his transition back into civilian life. Everyone has a different experience when balancing military service with college, but Furlong knows first-hand the challenges that are unique to the community. “A lot of [our prospective military students] have been out of school for so long, jumping back into it can be daunting,” he says. He also recognizes that “many of our undergraduate students tend to be non-traditional. They have families, children, and jobs because they have bills to pay,” he adds. They are often older than traditional undergraduates, as they are not enrolling in classes right out of high school. These non-traditional students, including those who are taking courses while enlisted, have to learn to juggle their many responsibilities so that neither coursework nor their service duties suffer. He also acknowledges that there is sometimes a misunderstanding of how the skills learned in the military can be applied to civilian life. Contrary to popular belief, he says, there aren’t any specific degrees that are more “military-friendly” than others. Before enrolling, Furlong suggests that prospective students spend time self-reflecting to uncover their personal motivations for earning a degree. Then, they can determine which programs will best help them achieve their goals and start to craft a plan to complete the right courses with an academic advisor. Transferring military skills is something that many newly enrolled military students need assistance with, and planning the right educational path can take some time. In the end, he says, your chosen career path may not share the same skills or trades that were used most during your time in the military. While servicemembers may face many unique challenges when returning to civilian life, the advantages they gain from their time in the service are hard to ignore. Veterans and servicemembers have life experiences and skills from the military that make them well-suited for classroom life, even while still serving. While college life isn’t as perilous, it certainly demands a great deal from students—especially those who are still serving or are raising kids while getting their degree. The coping skills gained while serving put military students at an advantage that younger, less-experienced students may not have. Because military members are in leadership positions at very young ages, they go on to mature and refine those skills through college and beyond. During his time working at Northeastern, Furlong feels that the institution has done an excellent job of recognizing those positive traits that military members bring into the classroom. Because of how well-traveled many military servicemembers are, they bring different perspectives and an appreciation of the global implications a college education can offer. Military students are capable and, just as importantly, willing to take some risks to get to the next level in life. Having an open mind about what civilian careers you might enjoy, regardless of your military experience, is important to make sure you pick the right degree program for you. You don’t have to wait to pursue your degree, either. Furlong shares that many students at Northeastern University are actively serving or serving in a guard or reserve role while attending full or part-time courses. Taking classes while in the military is actually a common pathway to a degree. How can I use my military education benefits? How will my military benefits be applied? What programs will match my military service skills? How can I attend while working or off-campus? Current or former members of the military should feel confident that they will get the highest level of attention when speaking with representatives there. For more information about joining the Northeastern community as a veteran or servicemember, contact the CAVS team today at nuvets@neu.edu. Linsey Knerl is a content contributor for Northeastern's Lifelong Learning Network.